CREATE MORE FLOOR SPACE ~ Replace bulky shelves with this modern book display and storage system. Beautifully crafted from a single piece of extra strong 0.2″ thick acrylic, this sleek design has no messy glue stains or parts to assemble. Solid & very Sturdy. Easy to Clean. 1. 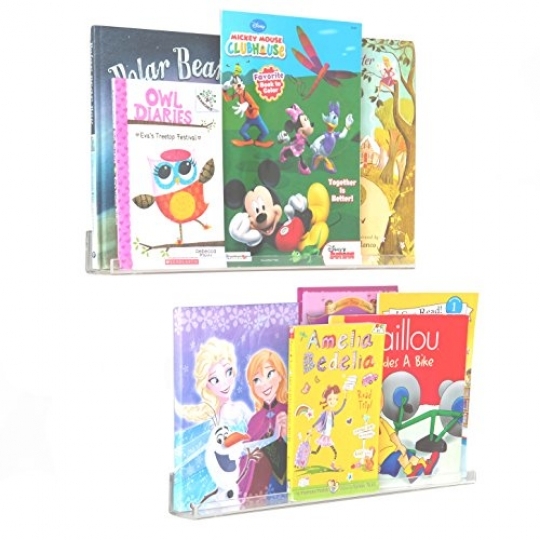 Can be also used in Kindergarten or other classroom to accent kid's books with an attractive shelf! 2. Display your kid's favorite books to encourage early childhood reading. 3. Plenty of storage for more , 2 shelves per set can store many kid's book. 5. Utilize space efficiently! You've got walls, use 'em! HIGH QUALITY THICK SHELVES Made of thick acrylic , you know you're getting a high quality, long lasting product.